If there’s one man in Pakistan cricket who can make a drama out of anything, it is Umar Akmal. He does know how to stay in the news, unfortunately for all the bad reasons. Umar Akmal has found himself at the center of yet another controversy after he accused Mickey Arthur, Head Coach of the National Cricket Team of using abusive language against him in a press conference on Wednesday. Umar Akmal’s career is full of highs and lows, probably more lows than highs. The list of his blunders and misconducts goes long, starting from faking an injury to prevent his brother Kamran Akmal from being dropped from the test side in 2010 to the latest controversy with Mickey Arthur. It all began with the rift between the two when Umar Akmal was sent back from England, after being included in the Champions Trophy squad, on account of failing his fitness test. Mickey Arthur recently warned Umar Akmal about his fitness issues saying that “the ball is in his court”. He [Arthur] shouldn’t be swearing at me like that, it is like he’s abusing all of Pakistan. You look at any cricket match, and you’ll see he’s swearing at one player or the other. I want to reveal this to the public and to all my fans. I request the chairman to take this issue very seriously. When the head coach is allowed to swear at someone whenever they wish, that is unacceptable. As a Pakistani, I could not stomach it. In response to Akmal’s press conference, the Pakistan Cricket Board (PCB) has issued a show-cause notice to him, asking him to respond within a fortnight. I did tell him [Akmal] a few home truths and said he was always looking for excuses instead of looking at himself. I also told him that he had to earn the right to use our support staff because he is not a contracted cricketer. He can’t just walk in here and demand what he wants. I didn’t tell the NCA about the injury because I was on tour when it occurred. I told the team doctor, who said straightaway it would need an operation. I believed all I needed was rehab, and asked him to advise me about exercises that I could do, and said I’d be willing to do them. Umar wanted to use services of Grant Flower for batting. I told him he must first earn the right to go and play club cricket since he is not under PCB contract anymore. Though Umar is not a centrally-contracted player, as a domestic cricketer he has to follow PCB rules and regulations. This is not looking good for Umar Akmal and his only chance of getting back in the team was to prove his fitness. Arthur, on the other hand, is in a strong position following his Champions Trophy winning campaign earlier this year with the Pakistan National team. Umar Akmal = Mickey Arthur Abused me infront of Senior players. Thank you Arthur"Aik puppy idher aur Aik Udher"
Mickey Arthur has done what no other coach (local or foreign) could do! All dirty linen like Umar Akmal must be removed from the closet. 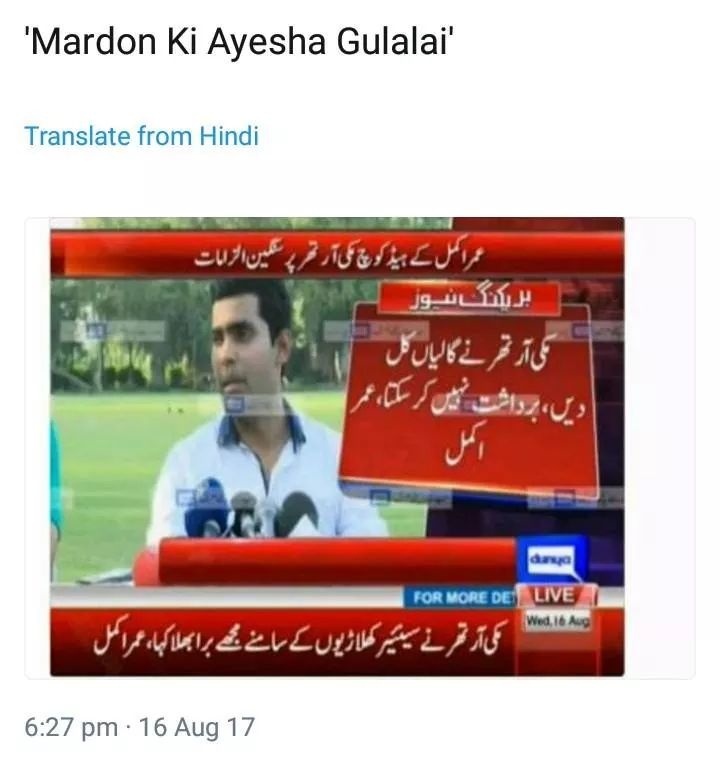 there is no redeeming quality left in Umar Akmal anymore, he has gone full retard. Only international century Umar Akmal has scored in last 7 years is against Afghanistan & some people still think he's world class. What do you think about the controversy? Sound off in the comments below. Umar its time YOU left the Pakistan Cricket Team alone, we have had enough of your dramas. Umar Akmal is such a BRAT !! Its hard to believe he is the cousin of sarfaraz and babar azam. Even Kamran Akmal is better than this douchebag. He shouldn’t be included in the team. He is a good for nothing guy. Shakal achi nahi to kartoot hi ache hote is insaan ke magar woh vi nahi hain. Cousin of Sarfaraz Ahmed ? Yeh to nahi pata tha. Ik PCB Shairman ( I forgot but I think Najam Sethi tha, not sure ) usne kaha tha press conference ap mera yakeen kren jab mene Sarfaraz Ahmed ko select keya tha Kamran Akmal ki jaggah tab mujhe pata nai tha yeh cousins hain. Mujhe bad me pata chala. Inki family me wicket keepers bht hn. The coach has a right to teach and discipline his students like all teachers. without discipline no student can learn.. if the coach scolded him (whatever way) that punishment was for him and him alone… why the heck is he trying to say that his teacher scolded the whole Pakistan… this sort of bad behavior should be strictly punished and Umar Akmal should be kicked out of the team… this will also shun the others (if any) for misbehaving with their teacher whose job is to teach and discipline them. Umar Akmal in Interview: Ye mere lie boht SHARAMFUL bat hai…. this thread made my day – being pakistani doesn’t make you privileged that you keep shitting in pakistan.